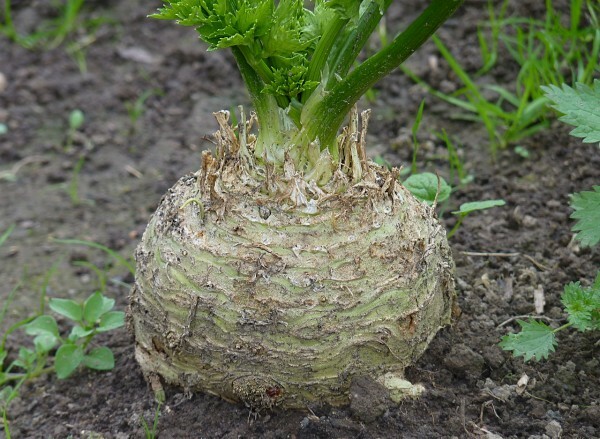 Celeriac is a root vegetable. In fact, it is the root of a particular variety of celery that is grown specifically for that bumpy, rough-looking root. The flavor of celeriac is nutty, mild, and celery-like. Three are all sorts of ways to prepare it, including mashed, pureed, stews, steamed, roasted, fried, and even raw in salads. An added bonus is it is very good for you, a good source of dietary fiber, vitamin B6, magnesium, and manganese, and a very good source of vitamin C, vitamin K, phosphorus, and potassium. - Place the celeriac in a bowl with salt, pepper, herbs, and the olive oil, toss until well coated. - Lightly smash the garlic cloves with the side of a knife and place on baking sheet. - Roast for 30 to 40 minutes, turning once halfway during the roasting time. Once they become golden and tender, they are ready to serve.